Any recent distribution should include kernels and userspace utilities with NFSv4 and rpcsec_gss support, and development versions can generally be found at linux-nfs.org. This page has some pointers to related development projects. Much of this code is work in progress, which may be only lightly tested before release. The NFSv4 Client Priorities and NFSv4 Server Priorities gives some oudated estimates of the progress of our effort. In the case of code written for existing projects, we provide either a git repository or patches. Patches must be applied to the upstream sources, which are linked to under "Upstream sources", below. A kernel repository is available from git://linux-nfs.org/~bfields/linux.git, which you can also browse here. nfs4-acl-tools-0.3.3.tar.gz has commandline and GUI (pic) NFSv4 ACL tools, which deal directly with NFSv4 ACLs. 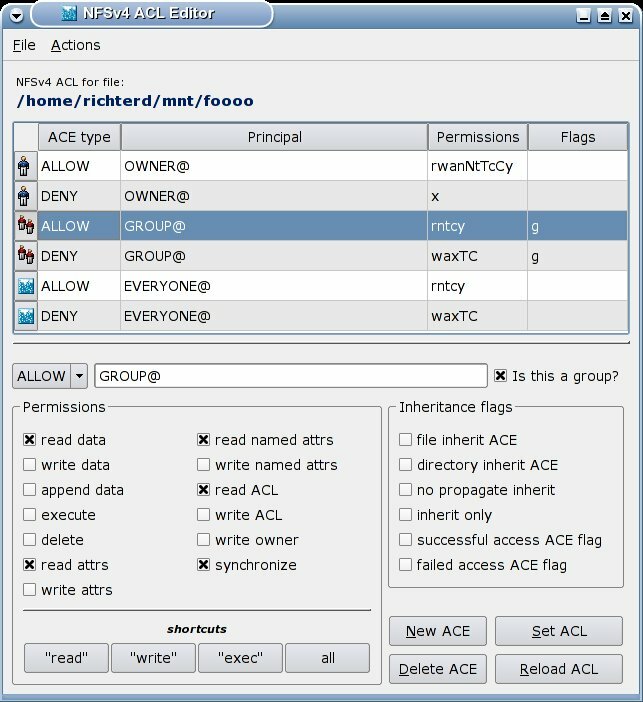 acl-2.2.42-CITI_NFS4_ALL-2.dif. (For developers, there is also a git repository; browse the repository here or available from git://linux-nfs.org/~bfields/acl.git). This patches the standard posix acl tools so they can handle NFSv4 ACLs by translating between posix and NFSv4 ACLs. The translation is lossy, and the patches make fundamental utilities such as cp and ls depend on ldap and krb5 libraries (among others), so the above is preferred. Notes on building these can be found here. libnfsidmap-0.25.tar.gz with instructions for libnfsidmap use. For related information, follow the "NFSv4 in a Multi-Realm Environment" link below. nfs-utils-1.1.2-CITI_NFS4_ALL-1.dif (for developers, also available as separate patches, with comments). The following instructions are meant to be followed, in order, after downloading all of the sources above. NFSv4 in a Multi-Realm Environment with a Kerberos V cross-realm example. FAQ: troubleshooting tips and commonly asked questions. NFSv4 Development: brief advice for new developers. Bug reports are appreciated; please report any problems to linux-nfs@vger.kernel.org; before posting, you may wish to consult the public archives of that list for similar problems. You may subscribe to linux-nfs@vger.kernel.org for discussion of the linux NFSv4 implementation. We have a basic list of features supported by the current linux NFSv4 implementation. Bull GNU/Linux NFSv4 Project: includes test results, administration tools, v6 support, NFS/IPv6 work, and more. OSDL's linux nfsv4 testing page. Learning NFSv4 with Fedora Core 2: Van Emery's detailed NFSv4 howto for FC2, the first distribution with built-in NFSv4 support.